Plastic Emesis Wash Basin BUY Medical Wash Basin, Emesis Basin, 23 oz Emesis Basin, H310-10, Wash Basin. Plastic Emesis Wash Basins is a 16 or 20 ounce Wash Basin designed for single patient use. Made from plastic, this Medical Wash Basin allows full immersion of the emesis or forearm. The Emesis Wash Basin is made from polypropylene and is 100% latex free to minimize allergic reactions. 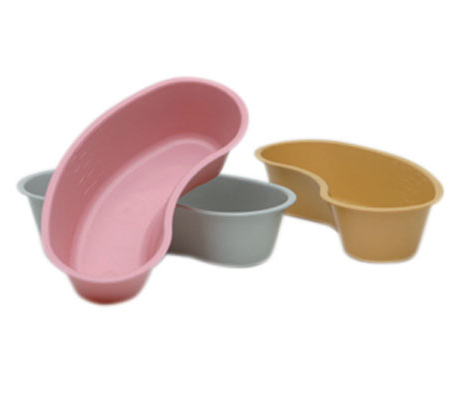 Plastic Emesis Wash Basin Product Numbers: M310-10, H300-05. Size Options: 8.4" x 3.8" x 2" or 9.7" x 4.7" x 2". Capacity Options: 16 oz/500 cc or 20 oz/700 cc. Color Options: Gold or Dusty Rose. Plastic Emesis Wash Basins are so easy to use and require no cleaning, just dispose of when done.